Comedy Central Presents... Live @ Parkers is a South African comedy television series inspired by Comedy Central's Live at Gotham and produced by Mannequin Pictures which is filmed live on the last Wednesday of every month at Parker's Comedy & Jive, Montecasino, Fourways, Johannesburg, with each event subsequently being broadcast on Comedy Central. 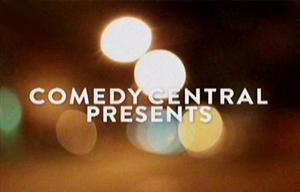 The series premiered on DStv's Comedy Central channel on Friday 18 May 2012, at 20h55. New episodes broadcast monthly, on the last Friday of every month. Inspired by Comedy Central's Live at Gotham, Comedy Central Presents... Live @ Parkers is a new laugh-out-loud comedy fixture brought to you by Comedy Central and Parker's Comedy Club. Taking place the last Wednesday of every month at Parker's Comedy & Jive, Montecasino, Fourways, Johannesburg, each event is subsequently broadcast on Comedy Central. Comedy Central Presents... Live @ Parkers showcases the best established and up-and-coming comedians in a relaxed and fun environment. Filmed in front of a live audience at the legendary Parker's Comedy Club in Montecasino, Johannesburg, each laugh-out-loud comedy showcase is hosted by a well-known stand-up artist, who MC's the gig and introduces three African comedians looking for their shot at the big time. Kicking off the series is award-winning South African comic John Vlismas. The show is hosted by a different comedian each month, beginning with (in order of appearance) Vlismas, Conrad Koch, Loyiso Gola and Barry Hilton. In each episode a fresh batch of comedians perform sets alongside the hosts. They include Donovan Goliath, Vittorio Leonardi, "Popps" Modikoane, Simmi Areff, Dave Levinsohn, Siya B, Deep Fried Man, Martin Jonas and Lazola Gola. Make a date with Comedy Central's first series dedicated to the African stand-up comedy scene.